"Give me your tired. your poor, your huddled masses yearning to breath free, the wretched refuse of your teeming shore. send these, the homeless, tempest-tost to me, I lift my lamp beside the golden door!" Characters move in a procession, as Einstein plays his violin. On the other side in the painting, balanced, a peasant plays the fiddle. The diverse group of characters, from all classes and races, include Oppenheimer, and Captain Jack, a Mohab Indian, killed even when he retreated to the least desirable land. These are all those the "mighty woman, mother of exiles," the Statue of Liberty, speaks to when she says: "Give me your tired. your poor, your huddled masses yearning to breath free..."
America is not a melting pot in this colorful painting. This painting celebrates America as a great opera of heightened drama because of its dancers, and their varied classes and ethnic backgrounds. 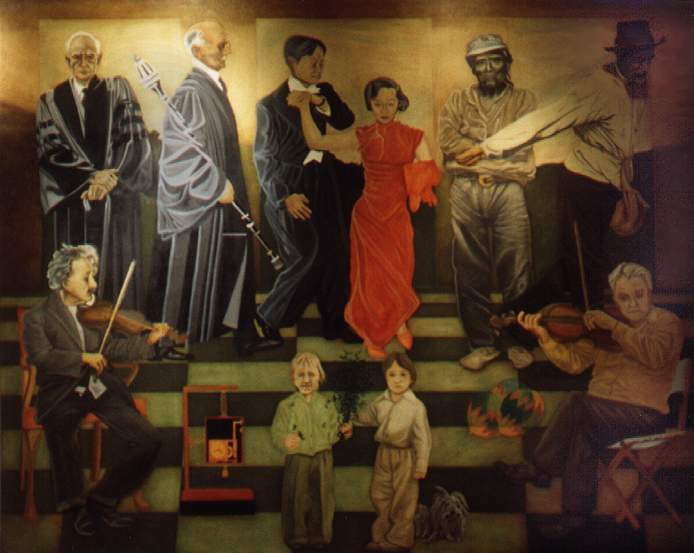 The children, often central in Wildcat's paintings, lead the procession. They hold olive branches, one Native American and one White child. America has few operas. Yet Wildcat's painting suggests that America's drama and diversity is one. The opera's intensity lifts our pageant, American music that moves us coming from instruments as varied as Einstein's violin, and the poor man's fiddle.